If you would like to mail a check, send it to the address below. Be sure to include a return address so that a receipt can be mailed to you. Make checks payable to Just Heart Foundation. 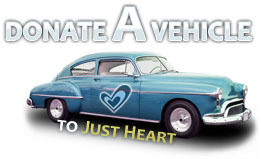 Donate your used vehicle here. No hassle, tax deductible, and we'll pick it up! Many employers offer to match charitable donations given by their employees. Check with your Human Resources department on what programs are available and how you can sign up. With the help of corporate gift matching programs we can double the impact we are making in the world. If you are a representative of your company's human resources department, click here to be directed to the contact us page.